Ford Racing - Full Blown comes with the cream of crop from the car manufacturer's long series of classic cars. Like the Thunderbird, SVT Cobra, '68 Mustang GT and more. All cars can be driven across 12 highly detailed tracks which include off-road, distant villages and even the beach. Players will not however have time to gaze at the scenery as they are confronted with dangerous turn in some very harsh weather conditions. Comes with force feedback steering, all 3 pedals accelerator, brake and clutch. As well as having a time release upgrade that can add 8 new cars and 12 more tracks. The game can link up to six drivers. Ford Racing - Full Blown comes with the cream of crop from the car manufacturer's long series of classic cars. Like the Thunderbird, SVT Cobra, '68 Mustang GT and more. All cars can be driven across 12 highly detailed tracks which include off-road, distant villages and even the beach. Players will not however have time to gaze at the scenery as they are confronted with dangerous turn in some very harsh weather conditions. Comes with force feedback steering, all 3 pedals accelerator, brake and clutch. As well as having a time release upgrade that can add 8 new cars and 12 more tracks. 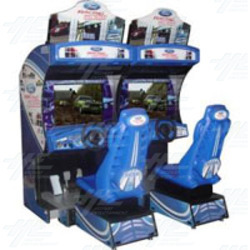 The game can link up to six drivers.